On the northwestern end of Vinalhaven Island in Penobscot Bay, off Crockett River Road. Grounds are open to the public but the tower is closed. Private residence. Vinalhaven is part of a group of islands referred as the Fox Islands after the gray foxes that once lived there in abundance. Vinalhaven Island lies about 13 miles from Rockland. 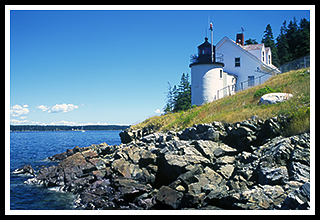 At one time, Vinalhaven Island was known for its rich resources of granite with its quarries and its lobster beds. Today this area still contains one of the largest lobster beds in the world. Brown's Head lighthouse was built in 1832 to help guide mariners and passenger ships through the western entrance to what are now called the Fox Islands Thorofare. Originally constructed of rubble rock in 1832, the current lighthouse tower was reconstructed of bricks and mortar on a ledge foundation as is today. Its location was always requested by keepers as an ideal place to raise their families. The first lighthouse keeper was M. A. Wooster and all keepers after him raised their single families to live at the site. 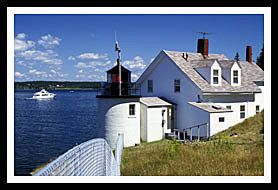 In 1987, Browns Head Light was among the last lighthouses in Maine to be automated. Today the town manger lives at the station. From the wharf at Rockland you can take the Maine State Ferry out to Vinalhaven Island. The lighthouse is now a private residence where the town manager lives, but the grounds are open to the public. At the lighthouse site and along the shores you’ll find wonderful views of islands out in the harbor. Vinalhaven Island is a large quiet island, predominantly a fishing community that offers plenty of small beaches to relax at and clear spring fed Booth’s and Lawson’s Quarries to swim in. The island lies about fifteen miles from the mainland and is the largest of the year round islands in Maine, with overnight accommodations for visitors. There are plenty of places to hike and picnic along Lane’s Island Preserve, along with various Vinalhaven town parks like Armbrust Hill, Grimes Park, Narrows Park, Isle-Au-Haut Mountain, Tip Toe Mountain, and Arey’s Neck Woods. This is a very quiet community where visitors can relax and recharge. The Maine State Ferry that departs from Rockland to Vinalhaven will bring you to the island in about an hour and a half, where you can walk, drive, or bike to the lighthouse. You may want to bring your car or bike since the lighthouse is about 6 miles from the Vinalhaven Ferry Terminal. To get to the lighthouse, take a right out of the parking lot then a left before Key Bank. Continue on and bear right at the fork by the waters edge (yield sign) past the swimming quarries. Bear left at the fork with “No Open Fires” sign and follow exactly 4 miles where you’ll find a dirt road on the left (look for a group of mailboxes at the intersection, Crockett River Road). Follow the dirt road past a cemetery on the right and take the next right dirt road to the parking lot in front of the lighthouse. The grounds are open but the lighthouse tower is closed. Please be wary of the privacy of the caretakers there. Boat cruises and ferries mentioned below may offer many types of cruises. While some may offer specific lighthouse cruises, some will pass by Brown's Head Light as part of sailing charters, narrated wildlife and historic tours, ferrying passengers, whale watching, fishing tours and other types of excursions. Weather is also a major factor in New England, especially on sailing excursions. Ferry to Matinicus Island, Vinalhaven, and Northhaven. From Vinalhaven Island you can drive or hike to the lighthouse. 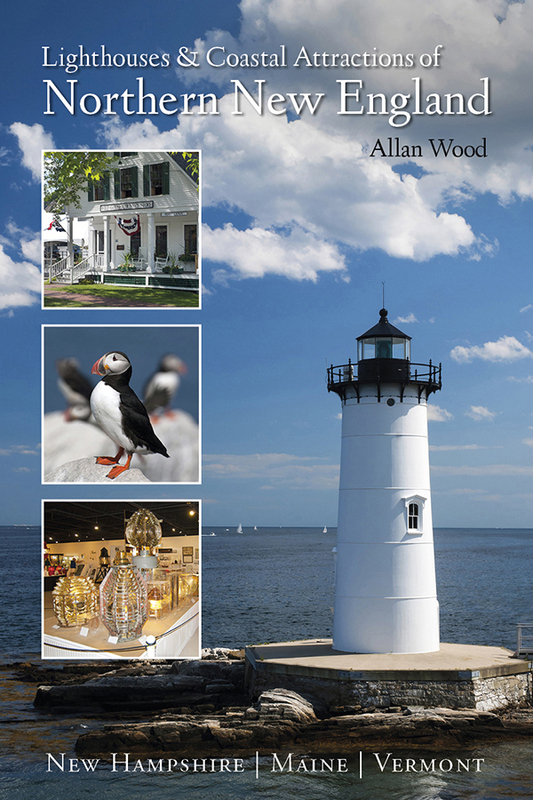 Provides narrated views of the lighthouse and five others on its lighthouse tours.